California wine country continues to grow. The Manton Valley American Viticultural Area (AVA) was approved on August 1, 2014. Situated in the foothills of Northern California’s Mount Lassen…wait, what? Yes, Manton Valley AVA is in far Northern California’s foothills, east of Redding. 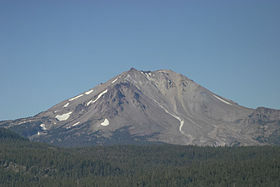 Mount Lassen is a dormant volcano, noted more for its bubbling, aromatic sulfur pools and mud pots than for pastoral vineyards. Yet grape vines thrive in volcanic soil, so this is an excellent area for viticulture. My first taste of a Manton Valley wine came last night, in the form of the Jim Olsen Syrah Manton Valley 2014, from Naked Wines (www.us.nakedwines.com). The Naked Wines copy suggests this may be the first red wine with “Manton Valley” printed on the label. As a 2014 vintage, this wine is still quite young, and will benefit from some bottle aging. However, even at this young age, the character of this wine shines through. I find wines grown in volcanic soil to have a rich profile, yet a light, mineral mouthfeel. Jim’s wine is like this. Available exclusively from Naked Wines, and already sold out, the Angel (member) price is $11.99. As popular a winemaker as Jim Olsen is with Naked Wines Angels, I am sure he will produce another vintage. 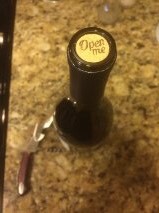 Naked Wines has some fun with corks. As if I need an invitation! This S yrah is a rich, deep ruby color. I poured it through a Vinturi aerator, and was met with pleasing aromas of ripe plum and white pepper. On the palate, there are flavors of late season, ripe raspberry and bramble, with cherry and tobacco leaf notes. The finish is medium length with spice and plum. This is a very young wine. When I tasted this wine, on 9/29/15, I am aware that these grapes were likely still on the vine a year ago. As a result, there is high acidity, and the tannins are a bit rough. Aeration and decanting will help in the short term, and a couple of years in the bottle will definitely transform this wine into a real gem! Frankly, I’ve not been to the Manton Valley AVA in person. As a relatively unknown, rural area, there would be none of the crowds and traffic that plague the more famous wine regions. Manton Valley is now on my list of places to visit. If you can’t make the trip, you can at least get there through a bottle of wine! ← Sauvignon Blanc: The Next Big Thing?